Over the past year or two, you may have noticed a style of beer called gose starting to appear with more regularity at your favorite beer bars, bottle shops, and breweries. Gose is pronounced gohz-uh, and is an old German style of beer experiencing a resurgence in the modern craft beer market. What exactly is a gose beer? that is tart, fruity, and quite refreshing. The primary ingredients in gose beers are wheat, barley, coriander, and salt. Gose is fermented with top fermenting ale yeast as well as lactobacillus, which makes the beer sour. More than half of the gose beers on the market also have fruit, which works perfectly with the sour and salt flavors. The refreshing and tart qualities of a gose is one reason why this beer is so popular, especially as a summer seasonal. There are many variations of gose beer, but in general a gose has a few common characteristics. The aroma usually has a light sourness and fruitiness, like smelling a fresh-cut lemon, accompanied with a very light grain or fresh bread quality. The salt sometimes gives it a hint of a clean sea breeze. It is typically not a hoppy smelling beer. The flavor has very little bitterness and a light to moderate sourness, which should be noticeable. The flavor of the sourness should be clean, simple, and fruit-like, not "complex" like a Belgian sour. The intensity of the sourness may be balanced by some malty sweetness but should not be overly sweet. A gose should be a crisp, refreshing beer and not something that is overly sugary and cloying. The salt flavors vary from barely noticeable to moderate but never overly salty. Similar to how it affects a sports drink, the salt imparts a refreshing quality and helps enhance the other flavors of the beer. The salt is particularly effective with fruit gose, accentuating the fruit flavors, especially when most of the fruit sugar has been fermented away. Many times a gose is quite effervescent, almost like champagne. Gose is not a strong beer; the alcohol by volume (ABV) is usually under 5% and sometimes as low as 4.2%. You may be wondering, with salt and coriander in this beer, doesn't that violate the reinheitsgebot, or German Beer Purity Law? It turns out that due to the historical nature of this beer, gose was one of the few styles given an exception to the law. With the German tradition of gose and sweet syrup and the American tradition of experimental craft beer, it is no surprise that many American-made gose beers are made with fruit, herbs, and spices. The fruit's flavor is accentuated by salt, and its tartness makes it refreshing and delightful. Modern Times in San Diego has an entire series of fruit gose beers called Fruitlands, featuring apricot, cherry, and passionfruit with guava. Pine Street in San Francisco has a perfectly crafted gose with grapefruit called It Came From Beneath. Rhinegeist in Cincinnati uses peaches in its Peach Dodo. Anderson Valley Brewing from Northern California has a wonderful gose with watermelon called Briney Melon. And the list goes on. This beer comes from Leipzig and is canonical of the style. The aroma has notes of citrus, lemon, pilsner malt, earth, hay, and spicy aroma with a touch of sea breeze. The flavor has a moderate but noticeably amount of sourness with just the right amount of malty sweetness to balance it out. The salt enhances the flavors but is not overwhelming. Refreshing and great on a warm summer day. bring it all together. It is almost like a refreshing sour lemonade with a pinch or two of salt. This beer is brewed with oranges and the traditional ingredients of coriander and salt. The aroma has notes of spicy coriander, lemons, tangy oranges, and saltwater. The flavor has lemon-like tart acidity and is primarily sour, secondarily salty, with just a tinge of sweetness. A savory quality helps enhance the flavors of the citrus. This beer has an almost champagne-like effervescence that makes it enjoyable to drink. Golden Gate Gose by Almanac Beer Co. This gose is made with coriander, lemon verbena, and bay sea salt. This beer has a light lemon scent with a wonderful, almost honey-like floral quality. The flavor has a citrus acidity and a crisp sourness with some residual sweetness and a touch of salt. Golden Gate Gose has a nice balance of flavors that complement the floral and citrus aromas. This gose is made with grapefruit, and is a great example of balance between the fruit profile and the traditional gose flavors. The aroma has notes of lemon, pomelo, grapefruit oil, and a touch of clean sea breeze. The flavor is noticeably tart, crisp, and refreshing with a little maltiness and a pinch of residual sweetness to balance the sourness. The salt is noticeable but helps enhance the grapefruit and pomelo flavors. The fizzy effervescence enhances the refreshing quality making it quite quaffable. to sour the beer further, making it funky and musky. Finally, the beer is dry hopped to give it more citrus and pine aromas. It may not smell like a salty beer, but it has a moderate amount of saltiness to compliment the tart, lemon-like flavors. It is both refreshing and complex. For more gose beer suggestions, check out my list of interesting gose beers on Beer 47. Special thanks to the following breweries for providing samples: Rhinegeist, Pine Street, and Anderson Valley. • Which Beer Glass Should You Use? 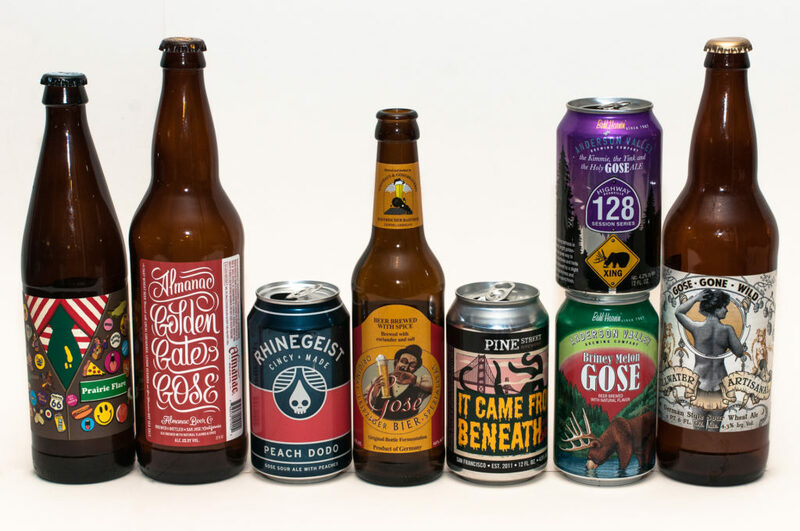 An Introduction to Gose Style Beers originally published on the Menuism Beer Blog. Dave Jensen is based out of San Francisco and is the primary writer and photographer for Beer 47, a blog focused on craft beer, beer events, brewery tours, cooking with beer, and home brewing. By day Dave continues his work in the beer world as a software developer and founder of BrewOps.